The Bush compound is the summer home of 41st President of the United States George H. W. Bush. It is located on Walker's Point (previously known as Point Vesuvius and home to a Kennebunkport city park called "Damon Park"). Walker's Point juts out into the Atlantic Ocean in southern Maine, in the town of Kennebunkport, Maine. The property has been a family retreat for more than a century. The estate was purchased in the late 19th century jointly by David Davis Walker, great-grandfather to President George H. W. Bush, and his son, St. Louis banker George H. Walker. Both built mansions on the point in 1902. D. D. Walker's mansion has since been torn down. In 1921 Dorothy Walker and Prescott Bush were married, and George Herbert Walker built a "bungalow" on the Point and gave it to them as a wedding present. When George H. Walker died in 1953, his son, George Herbert Walker, Jr. ("Herbie") purchased the property from his father's estate. It was not willed to him. Upon the death of Herbie Walker in 1977, the property again went up for sale and was purchased by Herbie's nephew, George H. W. Bush. The estate has since remained in the Bush family. President George H. W. Bush spent much of his childhood at the Kennebunkport estate. As an adult, Bush, his wife Barbara, and their children George W., Jeb, Marvin, Neil, Dorothy, and Robin spent most summers at the estate. The estate has been a backdrop of family weddings, holidays, and receptions. 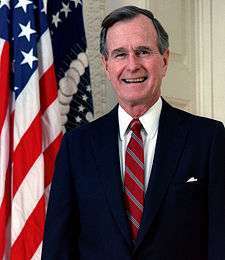 While at the "Summer White House," Bush hosted world leaders including Margaret Thatcher and Mikhail Gorbachev for informal and private meetings. As a young man, Bush relocated to Houston, Texas, and today the Bushes maintain a working residence in Tanglewood, where they spend most of their time. Bush's son, the 43rd President, George W. Bush, visits with family in Kennebunkport several times a year. His "Summer White House" also known as the "Western White House," was the Prairie Chapel Ranch near Crawford, Texas. The home and contents were substantially damaged by a strong series of storms in late October, 1991. The damage was estimated at $300,000–$400,000 and the President did receive an undisclosed amount in flood insurance, but failed to take the full deduction for storm damage on his 1991 tax return to avoid a conflict of interest as he was one responsible for declaring Maine as a 'disaster area'. Jeb Bush is building a home on Walker's Point. Former United States President Bill Clinton visited during the summer of 2011. Billy Graham and his wife Ruth Graham vacationed there with the elder Bushes. Former United States Secretary of State Colin Powell has been a guest in the Bush compound more than once. Retired Lieutenant General William Pagonis has been a guest in the Bush compound more than once. Former United States Secretary of State Condoleezza Rice convened the foreign policy advisory team assembled to brief George W. Bush prior to the 2000 U.S. presidential election. Wikimedia Commons has media related to Walkers Point. ↑ "3-Story Waves Heavily Damage Bush Vacation Compound in Southern Maine". The New York Times. November 1, 1991. Retrieved 2008-05-08. ↑ Jehl, Douglas (April 16, 1992). "'Millie's Book' Sends Bushes' Income Soaring". Los Angeles Times. ↑ "New cottage at Maine compound for Jeb Bush". The Boston Globe. May 23, 2015. Retrieved 2015-06-30. ↑ The President's News Conference With Prime Minister Mulroney of Canada in Kennebunkport, Maine. ↑ Associated Press, Bush, Sarkozy pledge close ties. Consulted on August 14, 2007. ↑ "The President Preacher; In Crisis, White House Turns to Billy Graham". The Washington Post. January 18, 1991. Retrieved 2007-08-18. ↑ Mann, James. 2004. Rise of the Vulcans: The History of Bush's War Cabinet. p. 250.